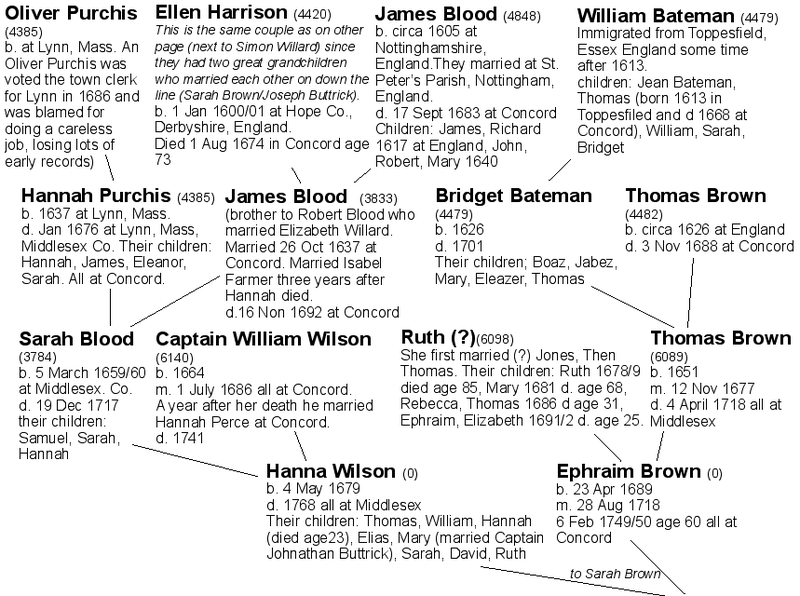 As some of you know, I began researching family roots over a decade ago. As beginners luck would have it, straight away I stumbled into the well-documented research of Sue Beach of Muncie, Indiana. She told me that I was her husband’s fourth cousin once removed (a descendant my great, great grandfather, Saurin Jenner’s sister) and promptly emailed the compilation of fifteen years of research (the Jenner’s line) to me and only asked that I pass it around to the Jenners side of the family. First, she emailed a 72-page document (the last 54 being bibliography) beginning with our own Grandma Obermeyer and going all the way back to 1470 in Horsemondon (County Kent), England. 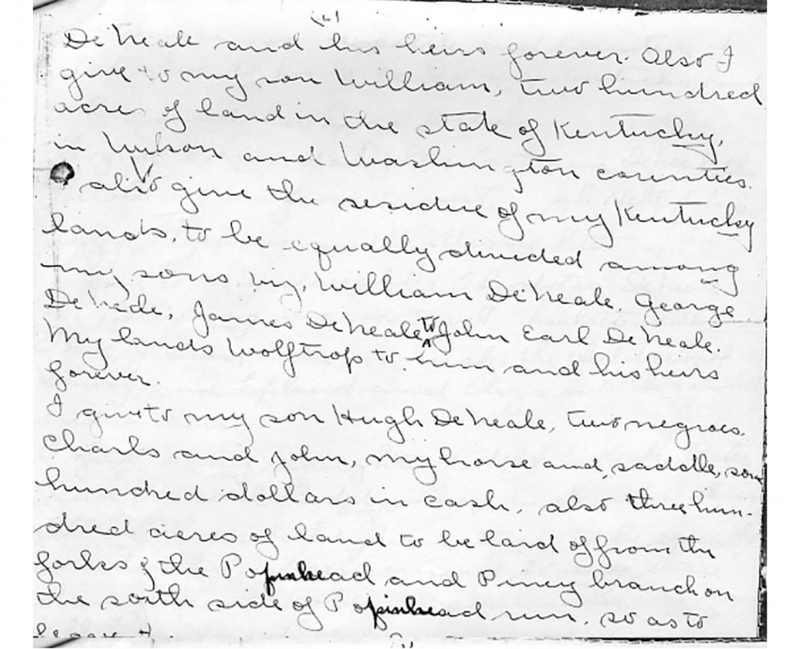 The document goes back 17 generations from my daughters, encompassing ancestors who came to the new world as Puritans to begin new settlements and trade (or fight) with the Indians, or to be an advocate for the “witches” of Salem. Others fought in the very first attack against the British in the Revolutionary War, and another sold land to George Washington to help create the District of Columbia. Still, others died horrific deaths in a natural gas explosion. A lot of information to process! Since then she’s sent detailed research on eight individuals of this line. These documents can be emailed to you, so just ask and I can send them. I’ve posted a summary of everything below, summarizing some things, adding additional info to others. 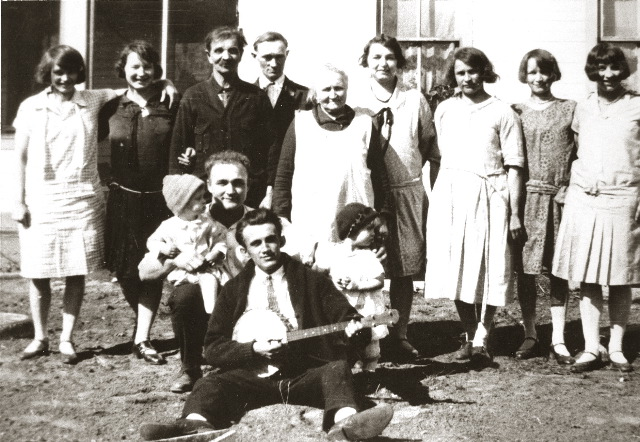 Mary Anthrop (the living one, of course) sent me a document of our Anthrop genealogy which was originally compiled for the 1929 (second annual) Anthrop reunion, along with updates. 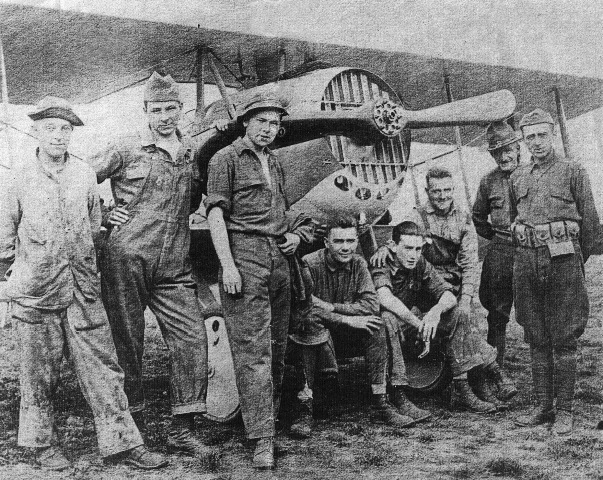 The reunion is still held every summer in Lafayette, Indiana. In May of 2008 Janet Douglas, one of Great Aunt Jennie’s grandaughters lent me an old bible with 19th and early 20th-century newspaper clippings and an old photo album with lots of great photos. Some are added to the photos on this page. Thanks, Janet! Early on, I began putting info and photos on this page, but soon decided to put it all in to book form. I was limited to 100 pages so I used each and every inch to put as much info in as possible. My mom, Mary Obermeyer Chesak has generously bought quite a few of them from MyPublisher.com (which is now defunct), so you may have seen it. For the Obermeyer, Hulka and Chesak lines, I have received info from relatives such as (now deceased) Rose Marie Pagel (Great Aunt Blanch Hulka’s daughter) through cousin Susie Obermeyer and info from Susie herself, plus a bit of my own research and the research of the Alexandria Virginia Historical Societies’ Lisa Adamo (who shares a same grandfather living in this area in the 1700s and founded Alexandria, VA) Dad had taken pictures of a large cache of photos and papers from the Hulka side, so with that, I ran across more interesting images and facts. He put them all on a disk which is available to family members. 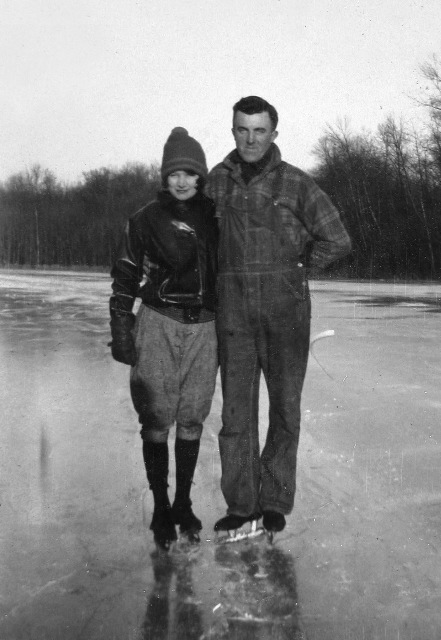 I also have compiled a 100 page photo book with captions of the Jenners/Obermeyer side, which has photos going back to Grandma Obermeyers mother and back to Henry Obermeyer. If you are interested in purchasing a copy you can do so through MyPublisher.com but you will have to contact me so I can order one or give you the info.This is an ongoing process so feel free to take this information and explore further. I’d appreciate any information or photos! I can scan and return them. 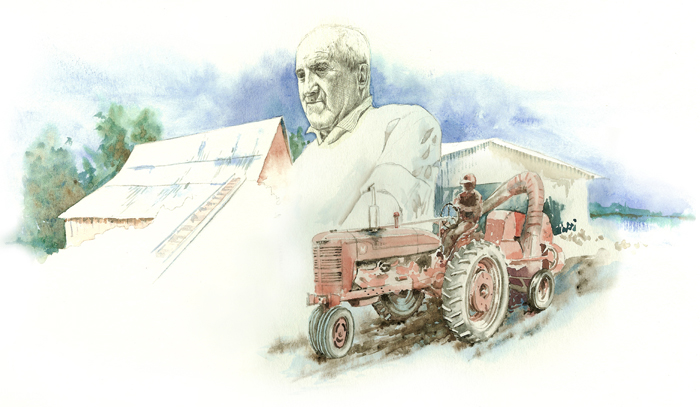 Above: The central part of Grandma Alberta (Jenners) Obermeyer’s line (the lines further down should be added to the left and right near the top. The numbers after each name refer to numbers assigned in Sue Beach’s research. Above: Sarah Brown’s line. 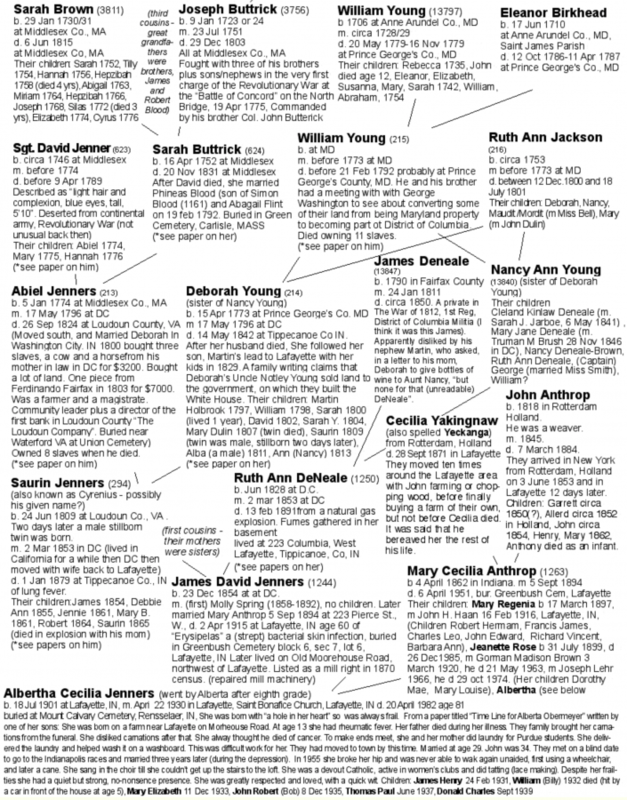 This is still part of Grandma (Jenners) Obermeyer’s line branching from the Jenner’s tree above. Above: Ruth Ann Jackson’s line. This also branches out from Grandma (Jenners) Obermeyer’s line above. 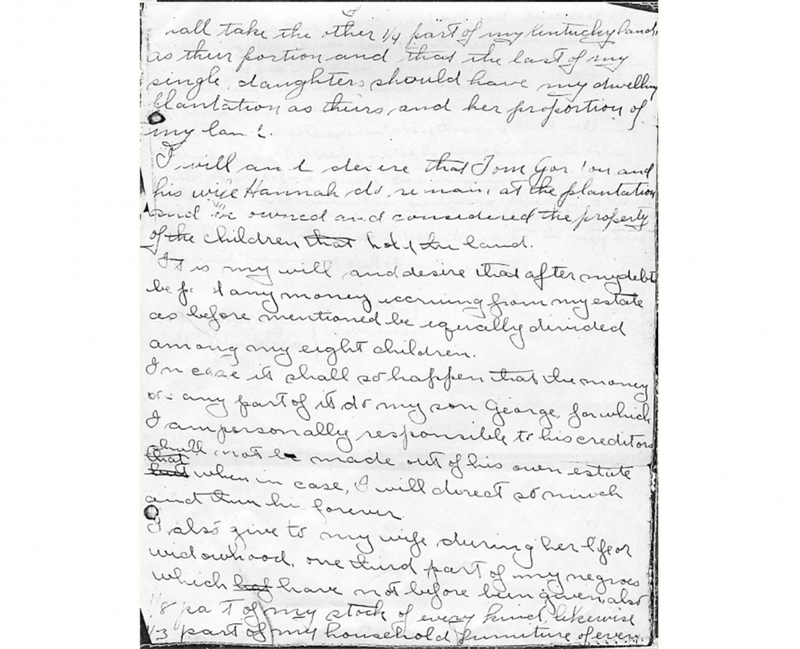 William Young’s and Eleanor Birkhead’s lines. This also branches from Grandma (Jenners) Obermeyer’s tree above. This is still part of Grandma (Jenners) Obermeyer’s line. 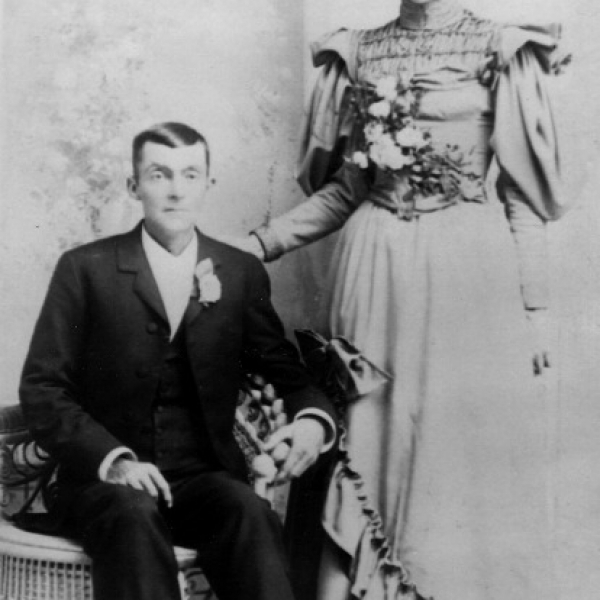 Sybil West married William Scott DeNeale. Her line has a lot of interesting things. Captain Harrison (below) once owned the property my husband and I own and the property my sister owns next door. Some of the West family below (Hugh and Sybil and their daughter Sybil West Carlyle (and her baby) who had been married to the wealthy British Merchant John Carslyle – see “The Carlyle House Historic Park”) had their grave vault interred about ten years ago from about two miles from my sister Lisa’s house in Alexandria from land which was once one of the West plantations. 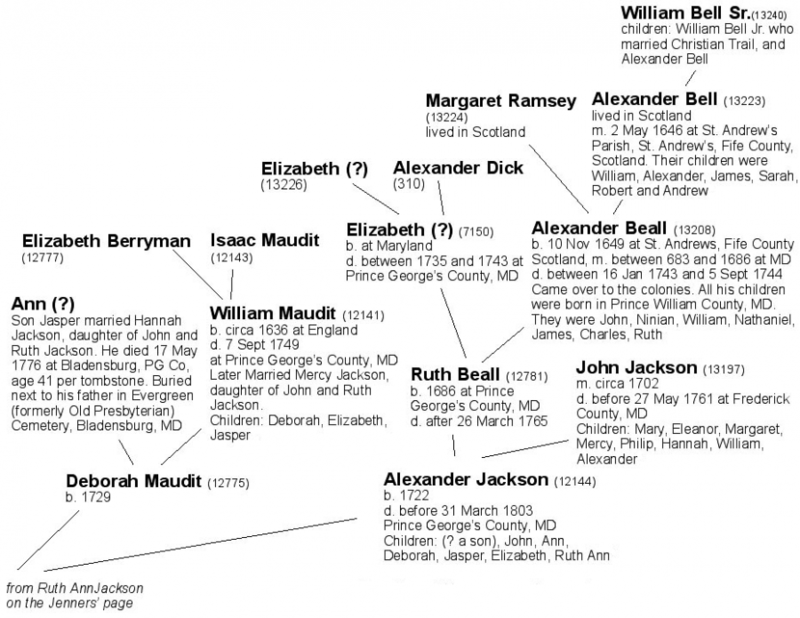 They were reinterred at the old Pohick Church in Alexandria. 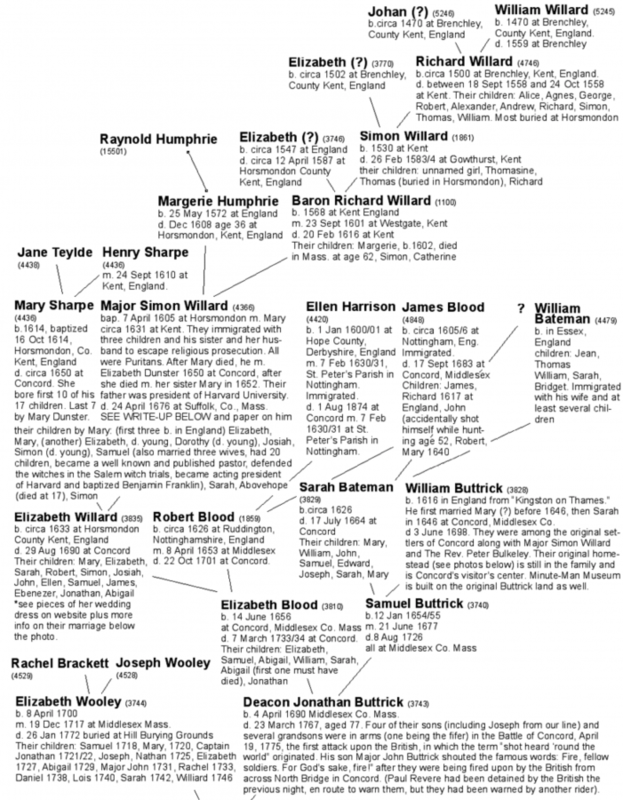 Sybil West’s line from a book called “Carter – Mitchell – Weir – Willcoxon and Related Families of Virginia and Maryland”, (Ch 18) based upon research by genealogist Harry Wright Newman. 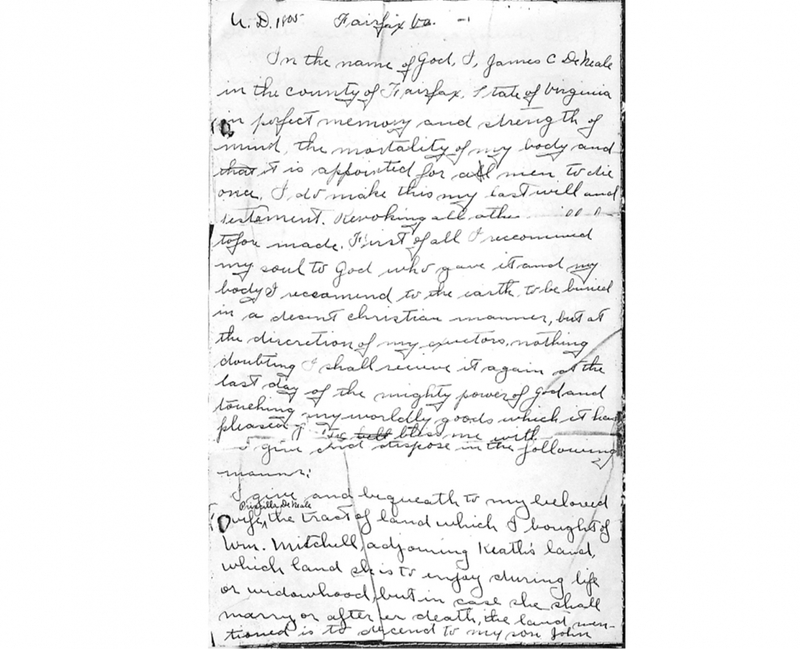 He signed an oath (within the publication) declaring the information is “true and correct to the best of his knowledge and belief” with a D.C. Notary Public, 1953. 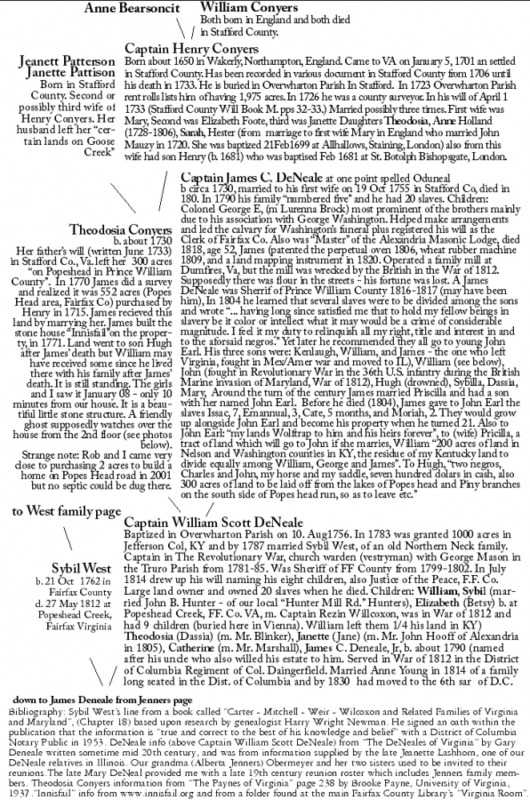 DeNeale info (above Captain William Scott DeNeale) from “The DeNeales of Virginia” by Gary Deneale (Mormons have it on microfilm) written sometime mid 20th century, and was from information supplied by the late Jeanette Lashhorn, one of our DeNeale relatives in Illinois. 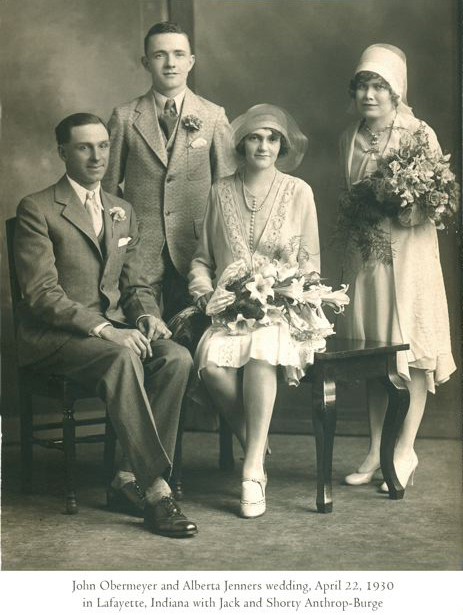 Our grandma (Alberta Jenners) Obermeyer and her two sisters used to be invited to their reunions. 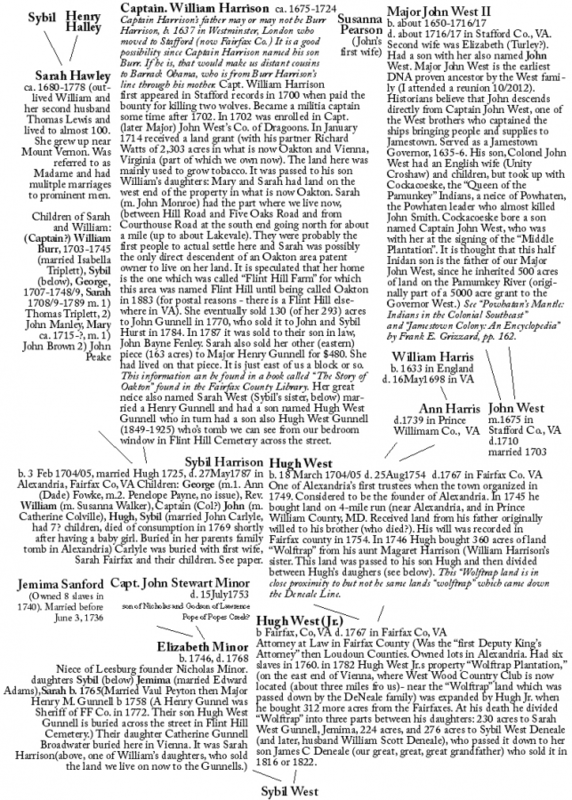 Theodosia Conyers information from “The Paynes of Virginia” page 238 by Brooke Payne, University of Virginia, 1937. “Innisfail” info from www.innisfail.org and from a folder of info found at the main Fairfax County Library’s “Virginia Room”. 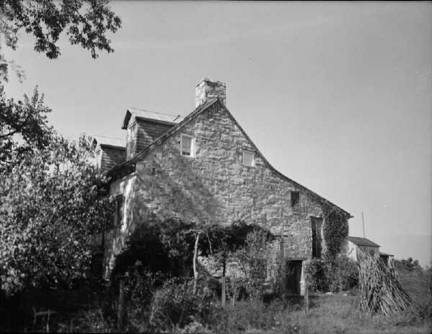 Above: Photo of “Innisfail,” a stone house in Fairfax County built by James C. DeNeale (great grandfather x5) in 1771. It is only a ten minute drive from us and is still standing. The upper floor is said to be inhabited by a “friendly ghost” which watches over the property. rather than the 300 that his wife Theodosia has been willed. Rob and I came close to purchasing two acres of this land in 2001, not realizing it had once been owned by ancestors. On January 15, 2008 the girls and I went to knock on the door but nobody was home. I don’t know if it was the thought that one of my grandparents was most likely born there, or whether the “friendly ghost” was trying to tell me something but as I opened the outer door to drop a note behind it, all the hair on my head stood on end! It was written a year before his death in 1806. There are some discrepencies with the names of his daughters here in the will and from other documents I have come across. I was surprised to see that one of the slaves he wills has my name. It is revealing in this document how there is not only a discrepancy in the treatment of blacks and whites but also of women and men. Sent by Mary DeNeal Beck of Illinois. This photo is of the Deneals of Illinois (they dropped the e). James C. Deneale (who built the stone house mentioned above) had several sons. We are from His son William. 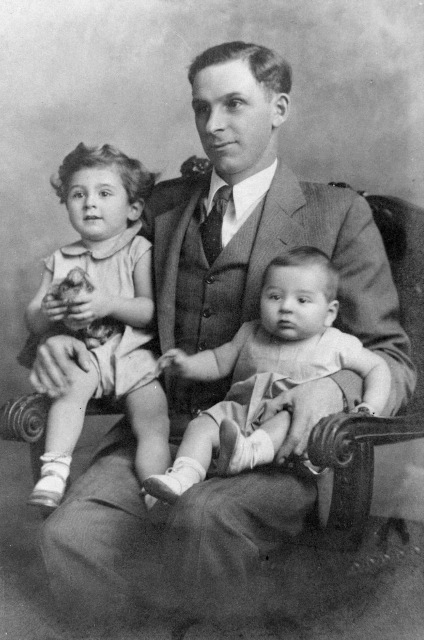 His son James had a son also named James C. pictured above in the chair (b. 1825 d. 1906). 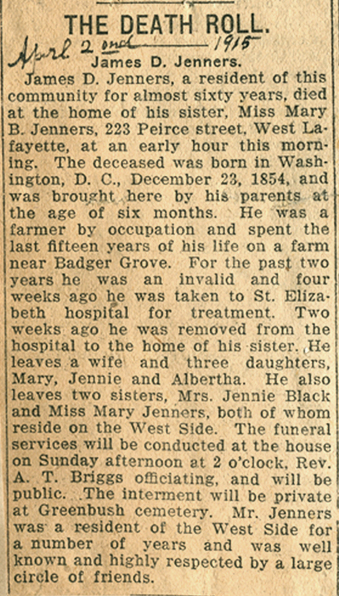 He moved to Vermillion County Illinois, the story goes, after he was in the Mexican War (mid 1800s). 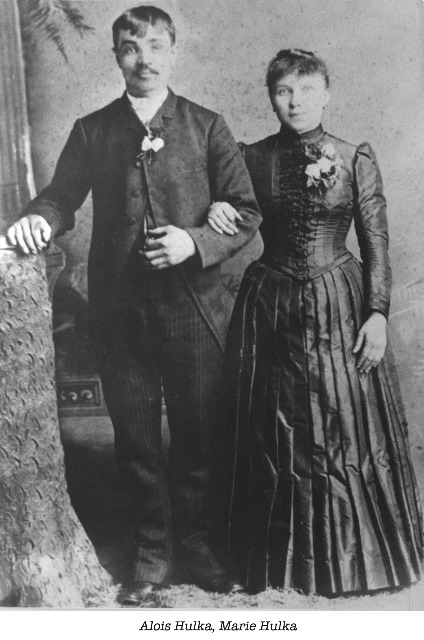 He is pictured here with his second wife Harriet McGrannahan. How does this relate to us? Grandma Obermeyer’s sisters Jennie and Mary, along with other Jenners family members used to attend “DeNeal” reunions with this family (obviously not the older ones since our great aunts came later). 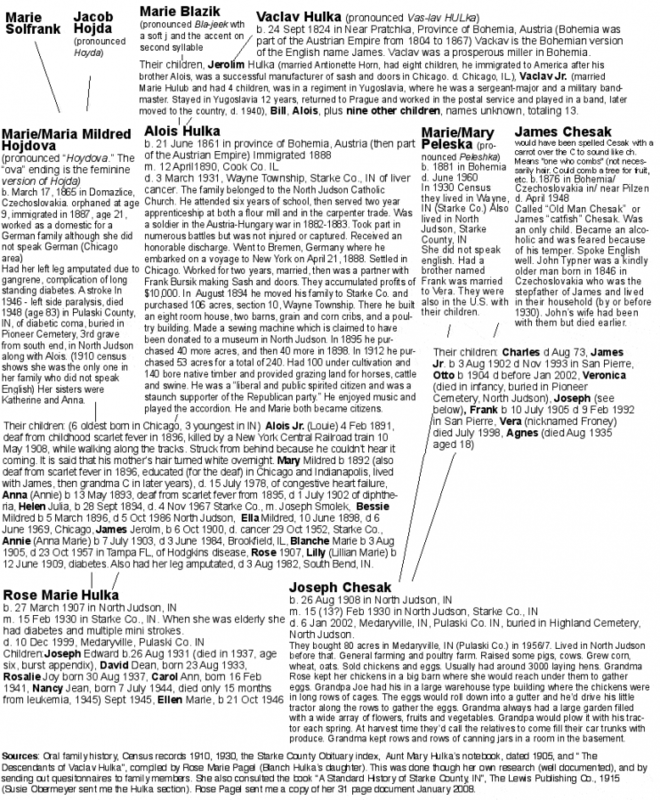 Grandma Alberta Obermeyer was on their Roster but never made it over to Illinois reunions. Photo and info courtesy of Mary DeNeal Beck, a distant cousin living in Illinois. 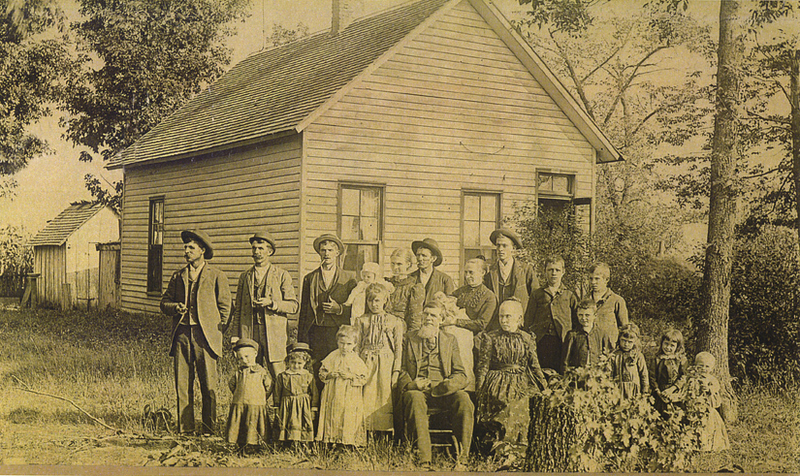 Alois and Marie Hulka (Grandma Chesak’s parents) and family in the 1900 census. This was before grandma was born. 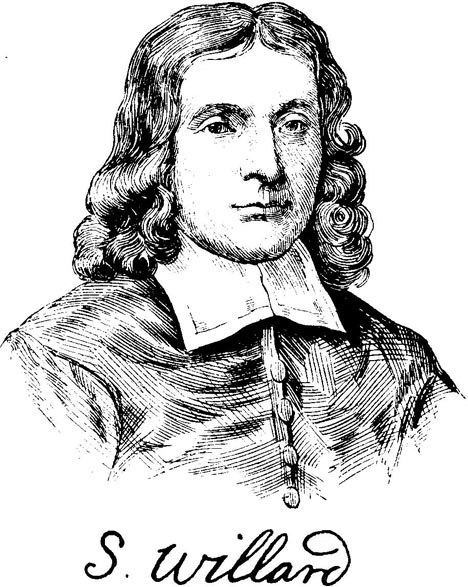 A Puritan, trained as an engineer and soldier, Simon immigrated in 1634 with his wife, sister, and brother to escape religious persecution. 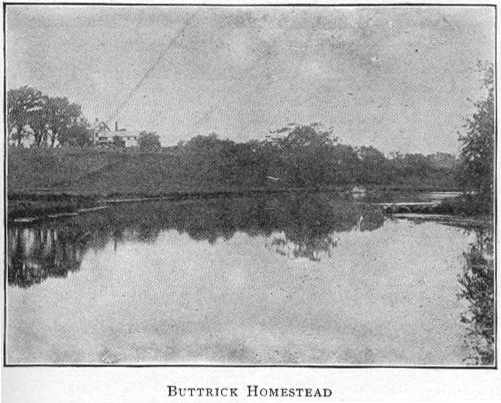 He first had a government land grant of 100 acres in “New Towne” Cambridge, Massachusetts on the west side of the river. While trading with the Indians (selling furs to England), he learned their language. Some said they had some land which he could purchase. 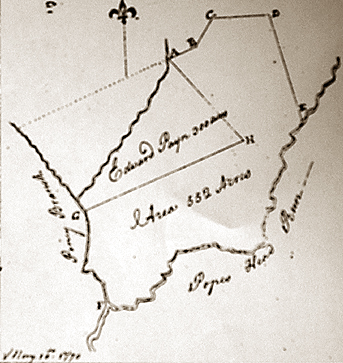 By 1635 he sold his 100 acres to go to a far “western frontier” and established “the plantation of Musketaquid” (which they named Concord) Mass. together with Reverend Peter Bulkely (New settlements required both a military leader and a religious leader). They brought along 12 other families (one of them being William Butterick and family (another grandfather (x8) whose great grandsons fought in the first charge of the Revolutionary War). 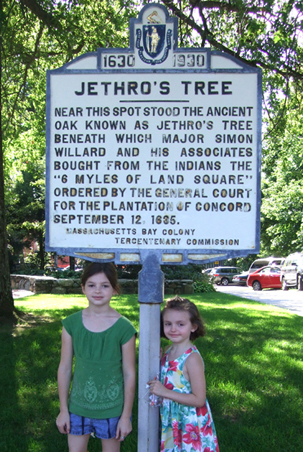 A sign is posted in the center of Concord which marks the spot where Willard traded for land with Squaw Sachem (or woman chief ) under a great oak tree. He traded hatchets, hoes, knives, cotton cloth and a little wampumpeage (money). 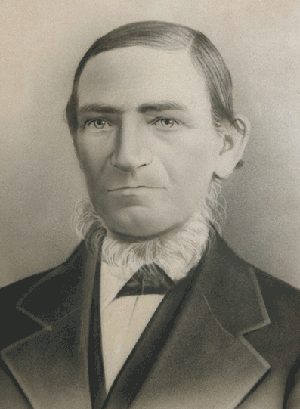 In addition, Webbacowet, Squaw Sachem’s husband wanted to look like Simon Willard, so they gave him a “a suit of cotton cloth, an hat, a white linen band, shoes, stockings, and a great coat, upon said bargain”. In return, the Indians gave them the “six myles of land square” which was to become Concord. The land had earlier been inhabited by Indians, but most died from diseases such as Smallpox, that earlier Europeans had brought with them. 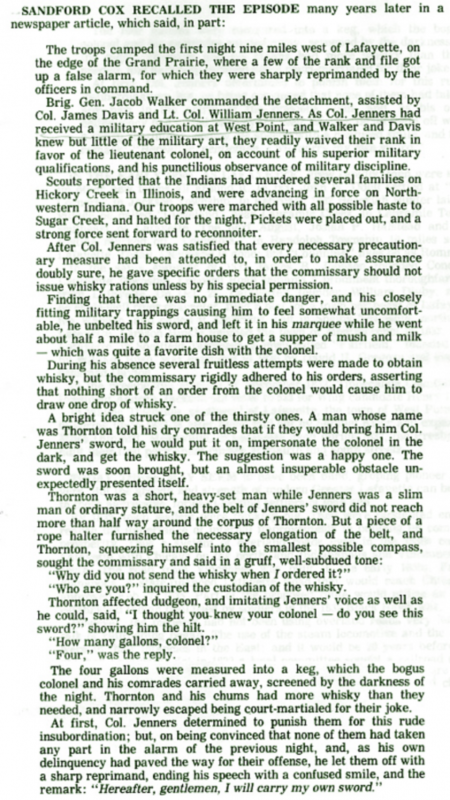 From “A History of Concord” by Lemuel Shattuck, 1835, referring to King Philip’s War (the earliest war between the Colonists and the Indians – “King Philip” was an Indian chief): “In 1654, an expedition had been undertaken by the United Colonies against Ninigret, principal Sachem (chief of the Niantics, which were a branch of the Naraganset Indians), when “250 foot and 40 horsemen were raised and sent fourth under the Christian and courageous Major Willard of Concord as commander in chief”. This was the first time that the early colonists were engaged in war. His house was burned to the ground in one of the Indian attacks. 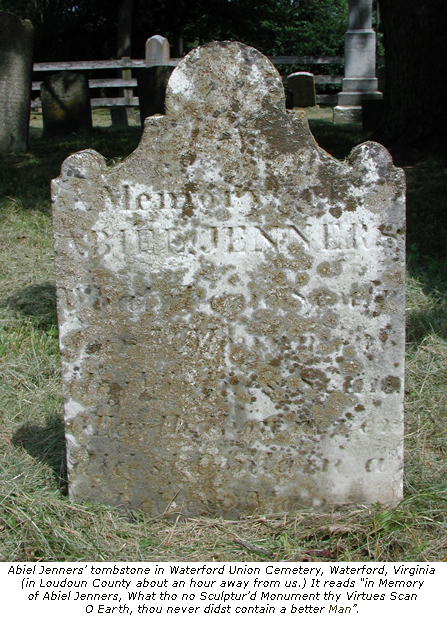 He commanded the Middlesex County militia for nearly 40 years and was the assistant to the governor for many years. Simon had 17 children from three wives. 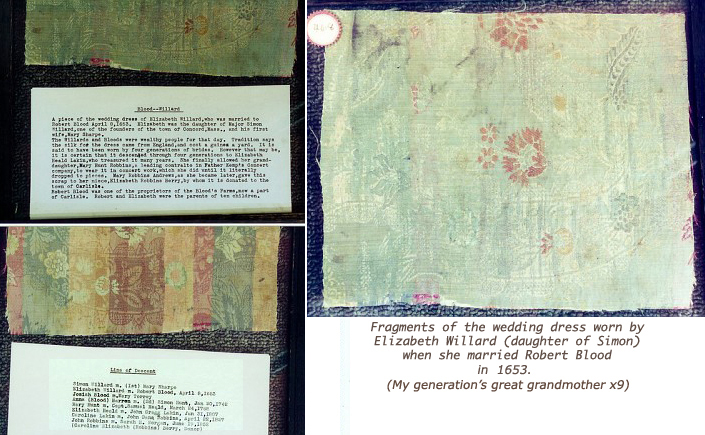 We are from the first wife, Mary Sharpe, descending from their daughter Elizabeth (see pieces of her wedding dress below). 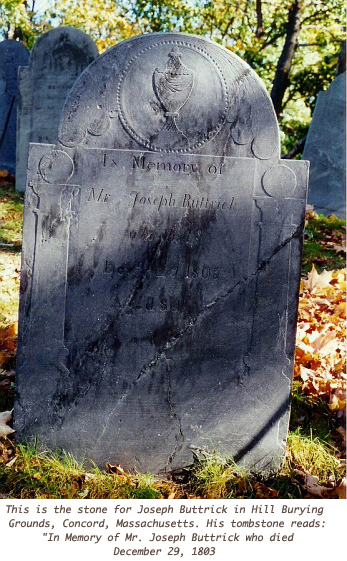 One of her (full) brothers was Reverend Samuel Willard, one of the major advocates for the women accused in the Salem Witch trials of 1692 (people accused him of being a witch as well, but his high standing protected him from real scrutiny). He was one of the leading intellectuals of American Puritanism, in favor of relaxing the heavy restrictions imposed on church members. As pastor of Boston’s “South Church”, he baptized Benjamin Franklin. He became acting president of Harvard University, and his son Joseph eventually became president. 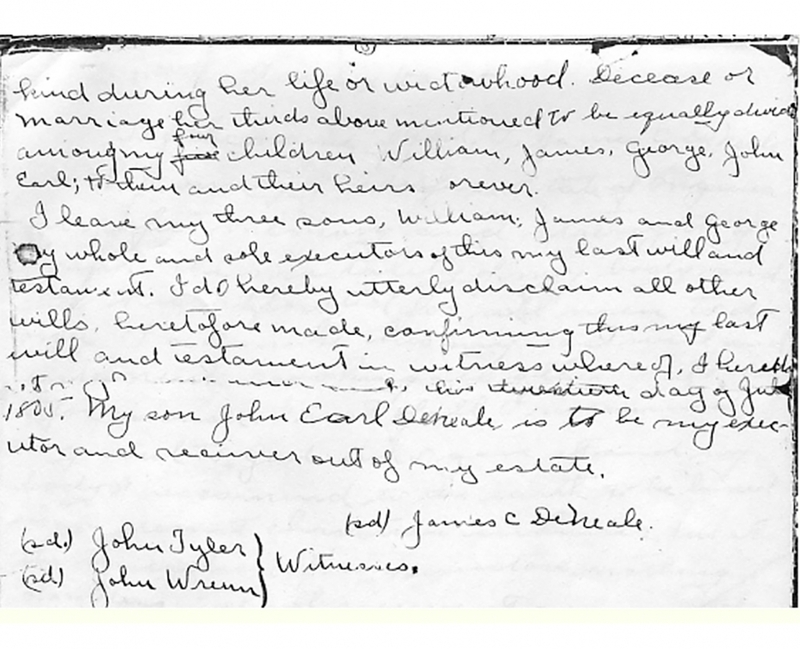 The second two wives were sisters – daughters of the president of Harvard. 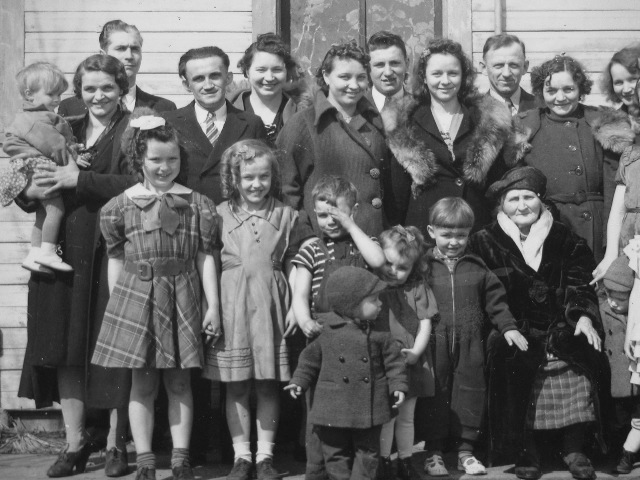 In a speech given at a recent “Willard Family Association” reunion, it was said that Simon and two siblings he immigrated with have over a million descendents. It was also mentioned in the same speech that Simon Willard is thought to have named Walden Pond in Concord, later made famous by Henry David Thoreau. Sign in Concord Massachusettes marking the spot where Simon Willard traded with the Indians for the land on which he helped found Concord. Mural showing Reverend Samuel Willard (Simon’s son and our great uncle x10), “one of the few voices of reason” during the Salem witch trials. He played an important role in halting the trials, as he urged caution in the accusing and trying of witches. Willard also denounced spectral evidence, claiming that the devil could impersonate even the innocent by appearing in their shape. Samuel later became a vice president (and acting president) of Harvard University and, as pastor of the “The Olde South Church” in Boston, he happened to baptize Benjamin Franklin shortly before his own death. 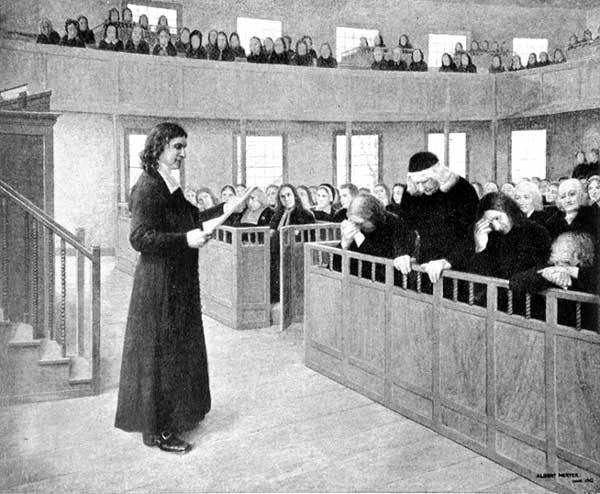 Description: In this mural size painting Samuel Sewall is shown standing in his pew, head bowed, in the South-Meeting House of Boston while the Rev. 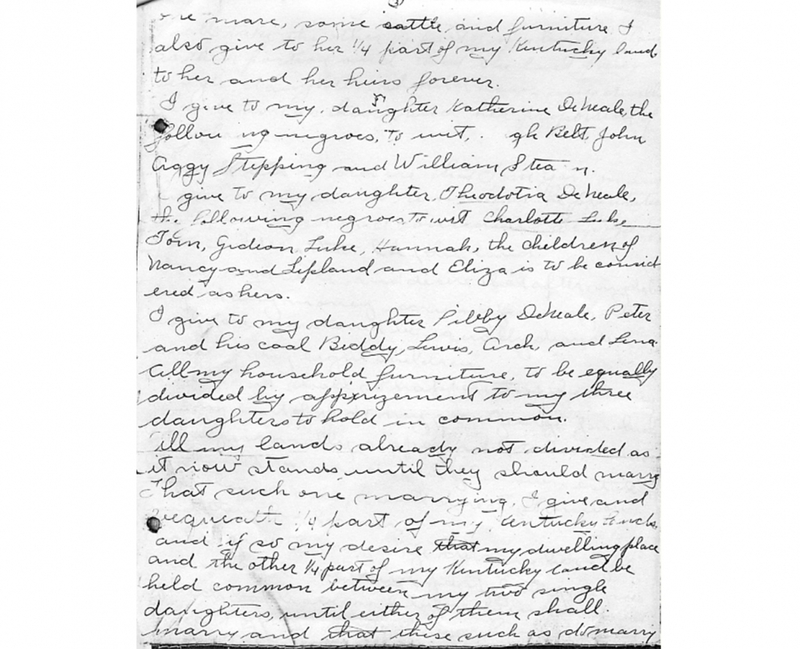 Samuel Willard, reads aloud Sewall’s statement of repentance for his role as a judge during the witch trials of 1692. The mural is one of five paintings that depict important events in the early history of Massachusetts, under the theme “Milestones on the Road to Freedom in Massachusetts.” The five paintings hang in the House of Representatives, State House, Boston. Artist, Albert Herter, 1942. Source: Pamphlet, “Milestones on the Road to Freedom in Massachusetts: Ceremonies at the Presentation,” January 18, 1943.p. 10. 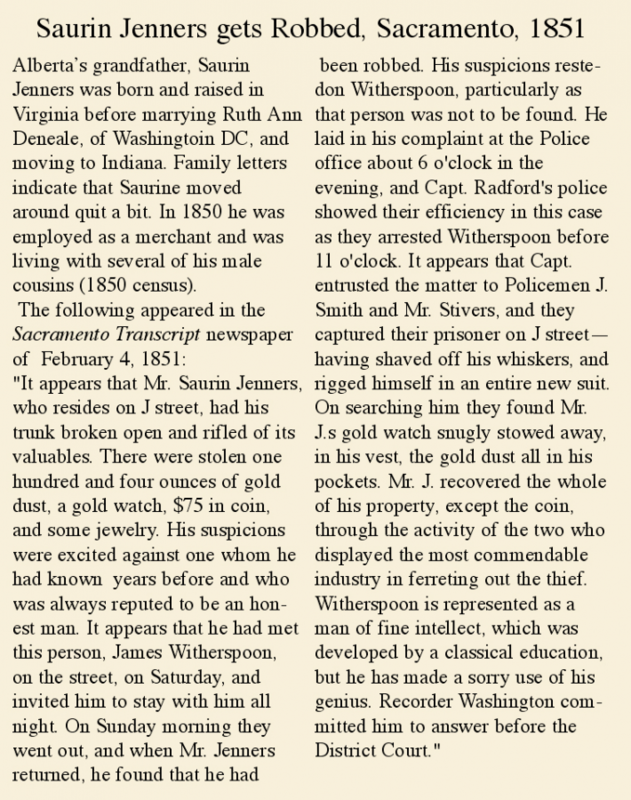 This is an interesting and funny story I found about our great, great, great uncle, Colonel William Jenners, the uncle of Grandma Obermeyer’s father. 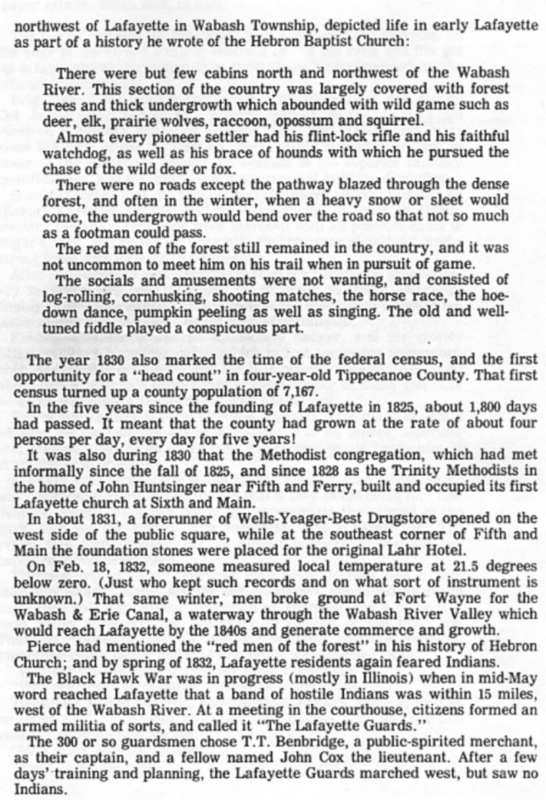 The first part is about early Lafayette, Indiana, while the last part (in green) is the story about William. 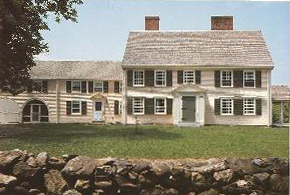 The Buttrick House (above and below) is now the visitor’s center in Concord, Massachusettes. My sister-in-law, Rose Liberace, actually worked there for the Park’s Department. 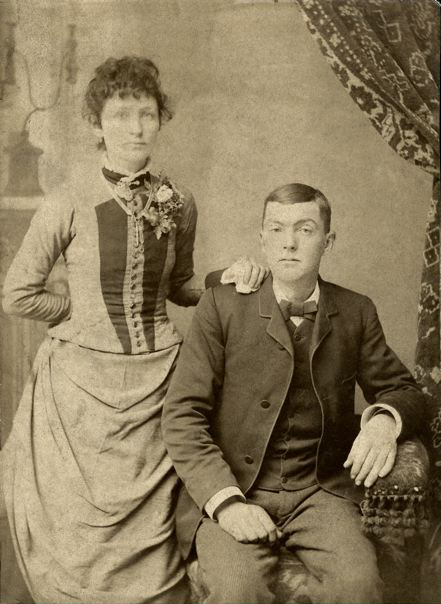 Great, great, grandfather John Anthrop, (Grandma Obermeyer’s grandpa) who came to the U.S. with his wife Cecilia in 1853 from Holland. 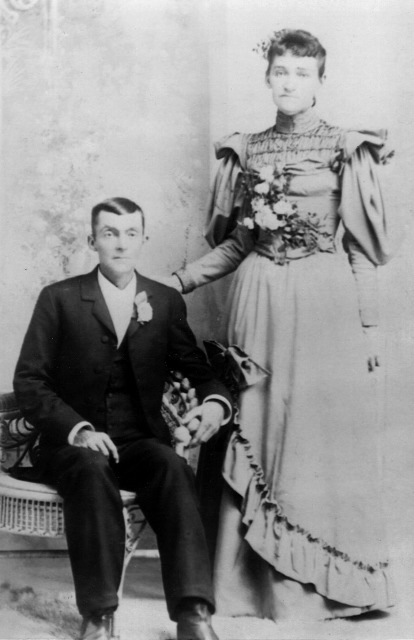 Mr. and Mrs. James David Jenners and Mary Cecilia Anthrop Jenners (Grandma Obermeyer’s parents) on the left. 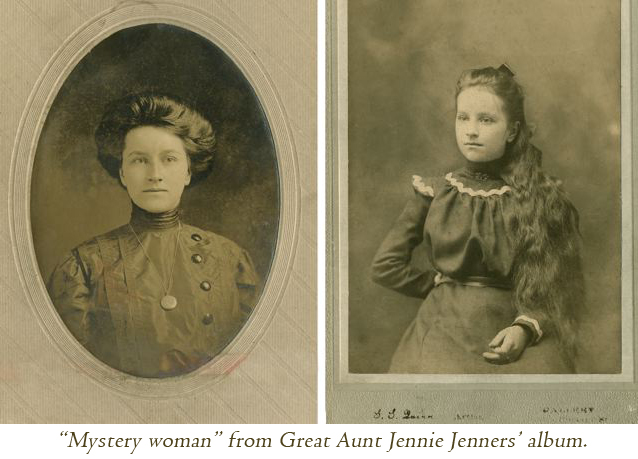 At first we thought these photos were both of the same lady but realized that the one on the right is James Jenners with his first wife, Molly Spring (1858-1892), who died before they had children. 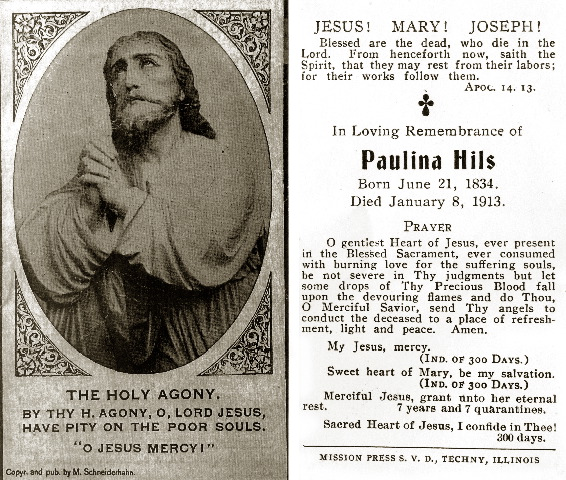 Her name is on the back of his tombstone at Greenbush Cemetery in Lafayette, Indiana. 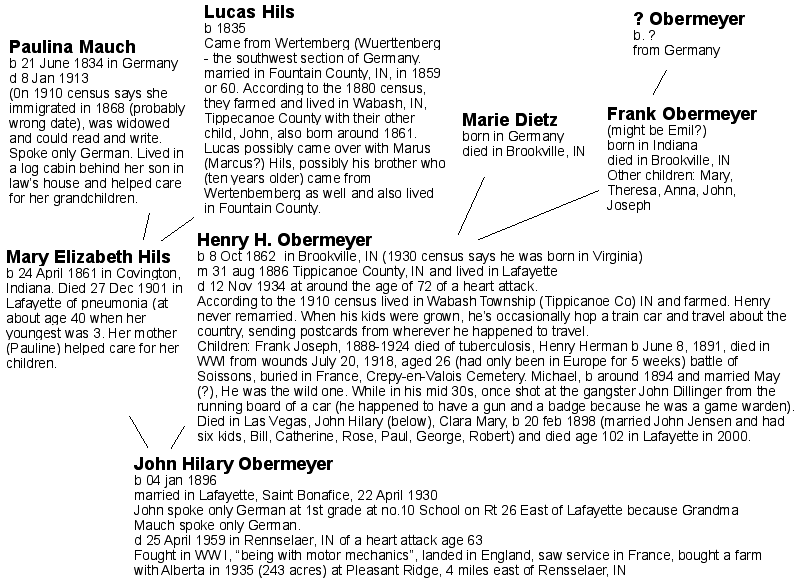 My mom says she doesn’t know much about the first wife except that Mary Anthrop was a neighbor and happened to help in preparing Molly’s body for burial (Lafayette, Indiana). Well, from what I can tell, I’d say that the first photo was taken in the early to mid 1880s just based on the tighter fitting sleeves and the draping in the front of her skirt implies that there must be some kind of bustle in the back (if I could see the actual shape of the bustle I could make a better guess on the year). 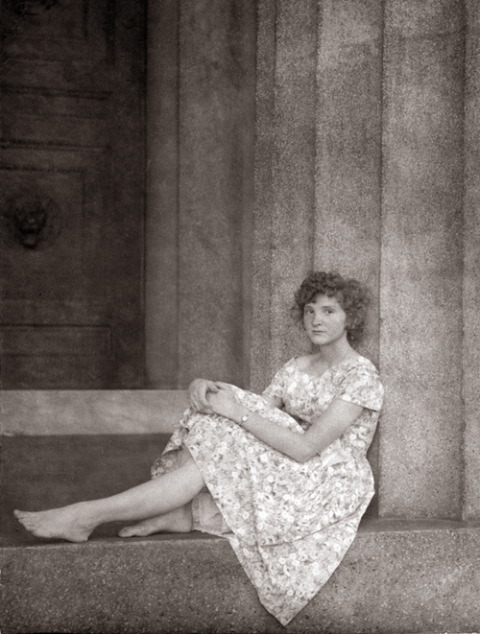 The second photo was taken at least 10 years later, in the 1890s when more emphasis was put on wider shoulders (to make the waist look smaller in comparison) and an A-line skirt…Also, the girl in the later photo looks younger than the girl in the first photo, I think it has to be a different person. (My dates are also based on Parisian and New York fashion at the time, I’m sure people in Indiana could be anywhere from 2 to 5 years behind that). Hope that helps! And it’s always fun to put family faces into what I know of costume history. 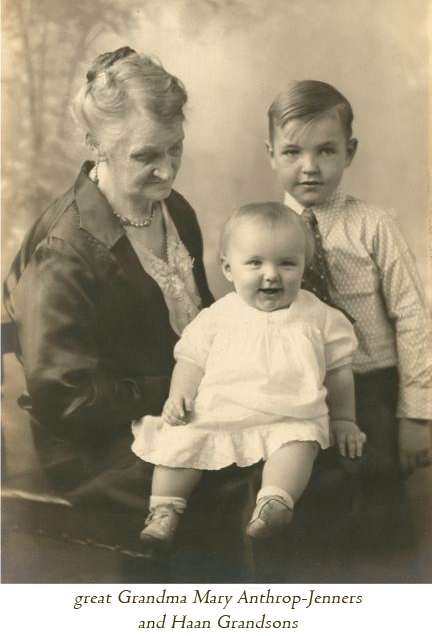 Grandma Alberta Jenners-Obermeyer with grandchildren Billy and Janie Obermeyer. Jenners) at Greenbush Cemetery in Lafayette. Researched by Sue Beach. 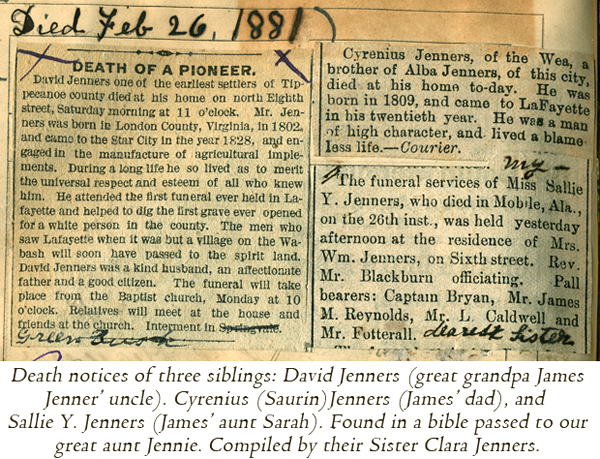 Debbie Ann (Deborah) Jenners was James’, Mary and Jennie Jenner’s sister (Grandma Obermeyer’s aunt). 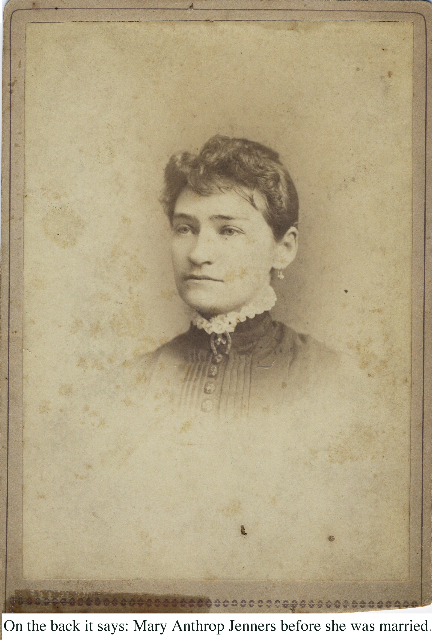 I had written “mystery woman” below the photos above which came from the photo album passed down to Grandma Albert Obermeyer’s sister Jennie. 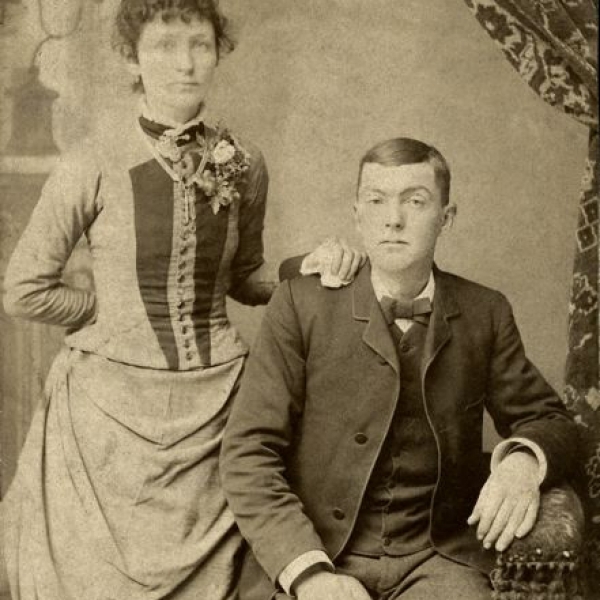 Deborah is missing from much of our family history because she died in her early 20s (I don’t know the cause) and was buried under the same tombstone in Lafayette, Indiana with her brother Saurin who was killed in the 1891 gas explosion in Lafayette along with his mother. 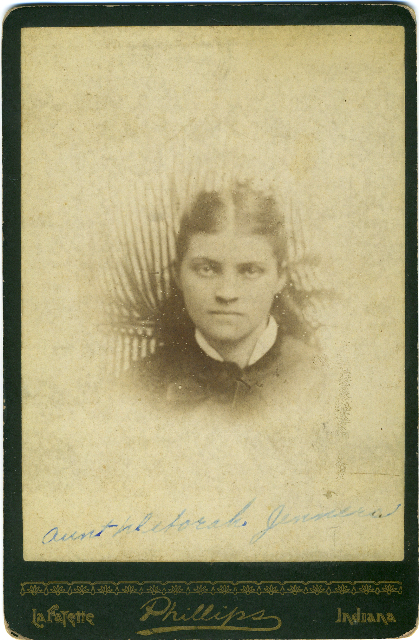 Deborah was born in 1855 so died before her mother and brother. 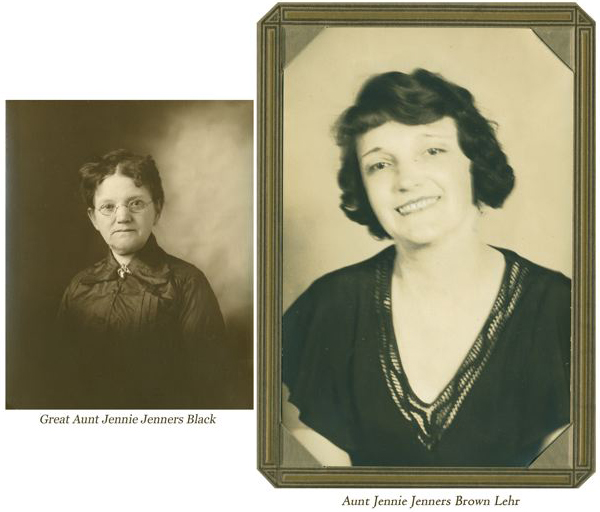 Photos of Mary and Jenny (Grandma Obermeyer’s father’s sisters shown above) as older women. 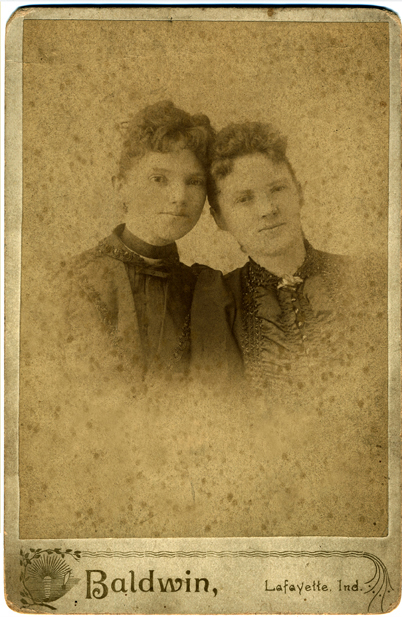 Below: Grandma Obermeyer’s Aunt Jennie and her sister Jennie. funeral home for her. She used to say that she didn’t like carnations for the rest of her life. 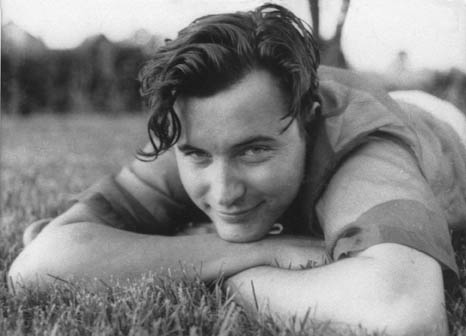 In the Rocking chair, Uncle Clark Black (Jennie Jenners Black’s husband). This was written on the photo. She is most likely the one next to him. 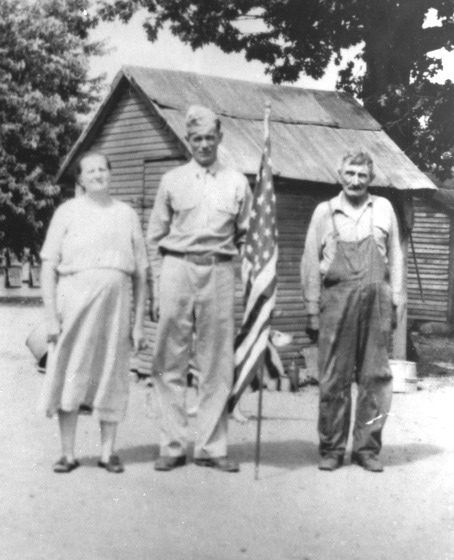 Grandpa James Jenners is steated on the step with Aunt Jenny Jenners Brown Lehr in front of him. 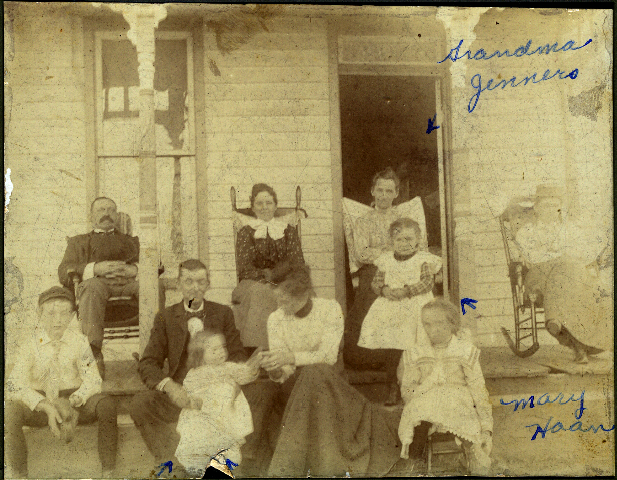 In the rocking chair in front of the door is Grandma Mary Jenners with Aunt Mary Jenners Hahn in front of her. 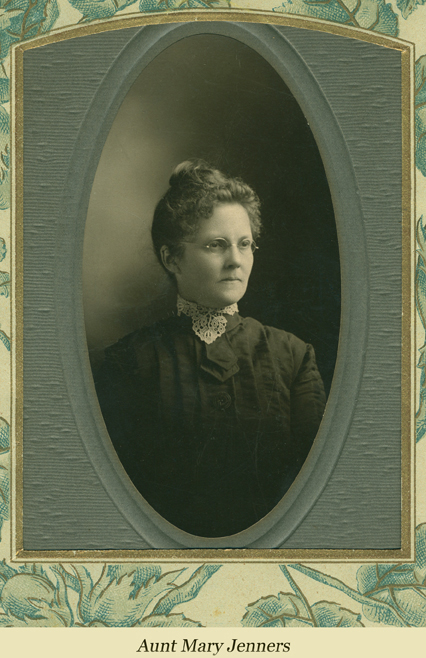 Grandma Alberta Jenners Obermeyer was not born until 1901. 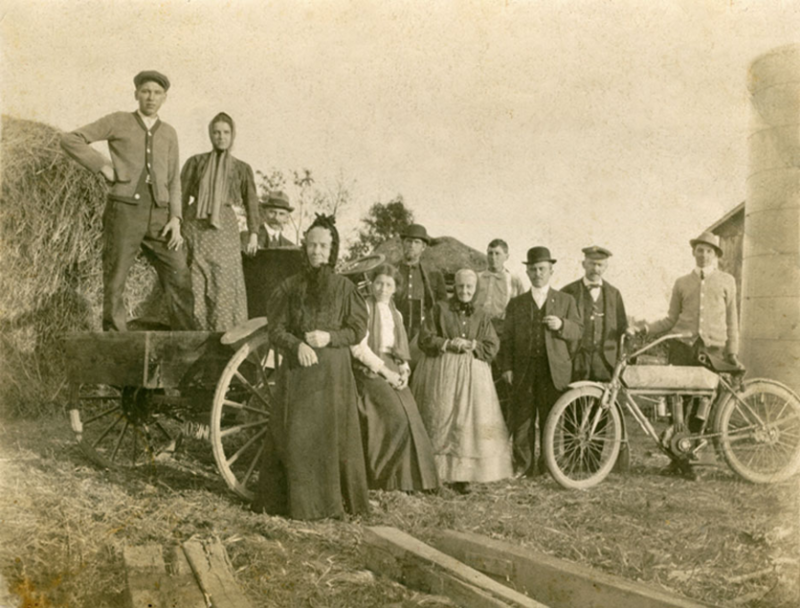 This photo was most likely taken in 1900 or 1901. The woman in. the front center is unknown (although I see a resemblance to my Mom, Mary Obermeyer Chesak so I’ll bet she is a Jenners!) Also, the two children left and right plus the woman faded out on the right are unknown. Maybe the woman are Debbie Ann or Mary Jenners – James’ other sisters? Photo taken in Lafayette, Indiana. Supplied by Barbara Haan Virgin of Lafayette (Mom’s first cousin). 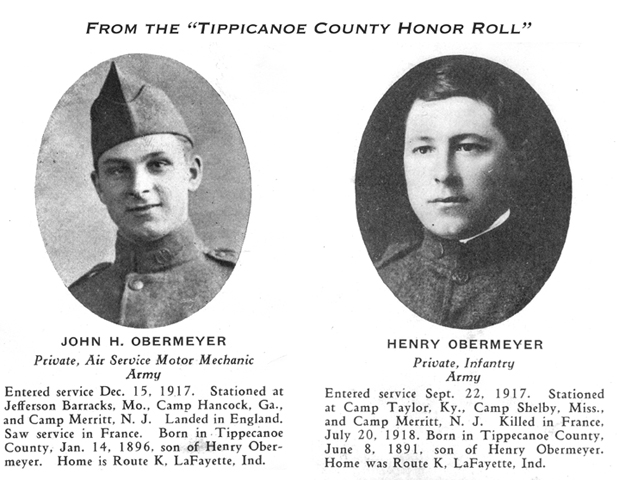 Grandpa Obermeyer and his brother, Henry (who was killed in France in 1918). 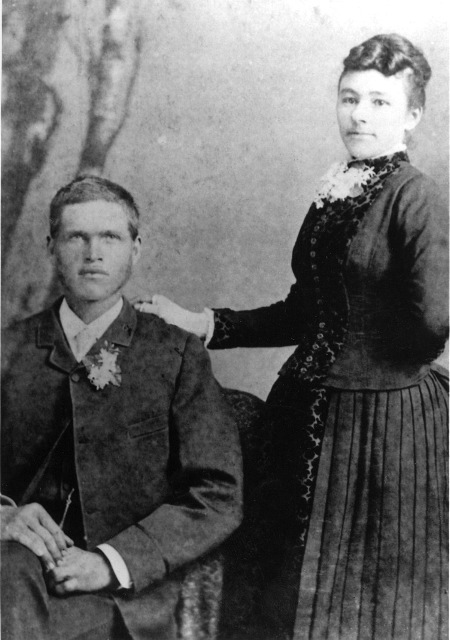 Henry Obermeyer and Mary Hils Obermeyer (Grandpa John Obermeyer’s parents). in the front is most likely her sister in law -as her last name is Mauch The young girl behind her is a Mauch as well. 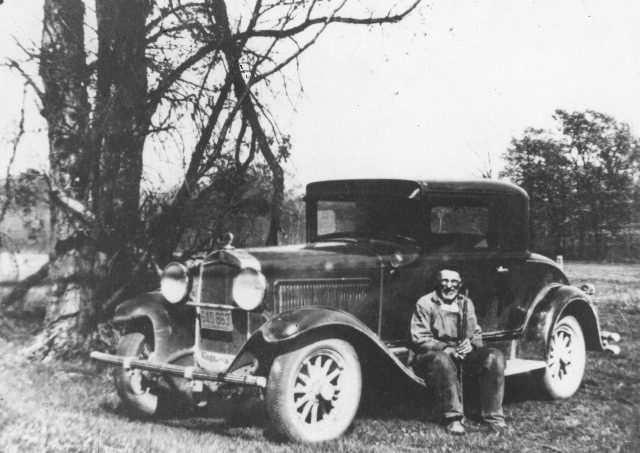 (who took care Grandpa John Obermeyer and his siblings). 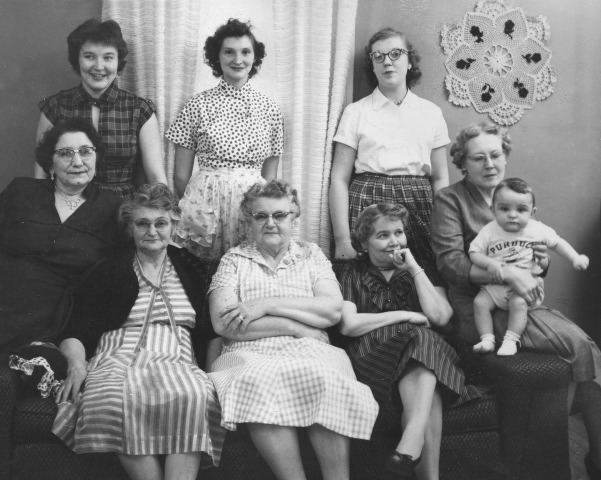 Grandma Alberta Jenners Obermeyer at lower left and her sister Mary Jenners Haan next to her, next “Shory” Anthrop Burge (Alberta’s maid-of-honor/ first cousin). 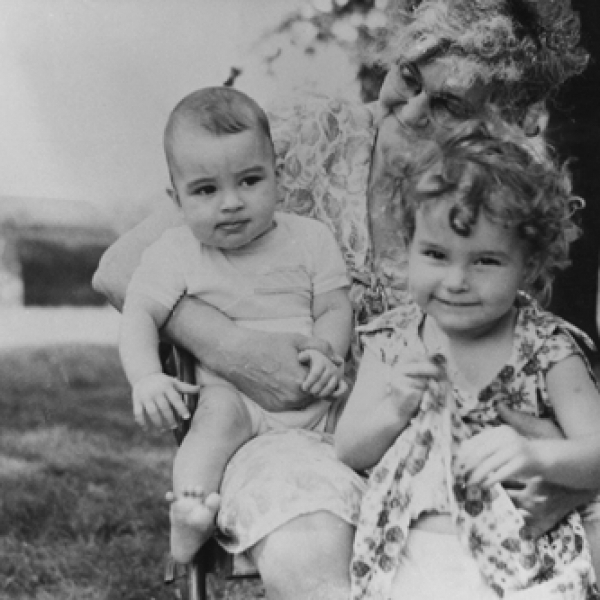 David Chesak Jr. is the baby, held by Louella Anthrop Bulluck. 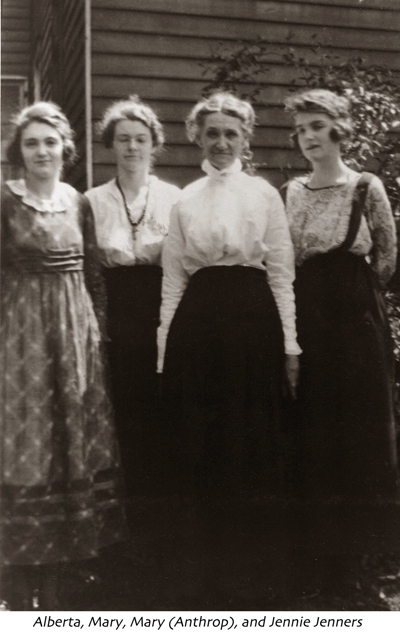 The lady at the left (dark dress) is Doxie Martin, Alberta’s friend and Mary Obermeyer Chesak’s godmother. Top left to right Rosalie Chesak Obermeyer, Mary Obermeyer Chesak, and Barbara Haan Virgin. Photo taken in 1957, Lafayette, IN. The Hulka family. 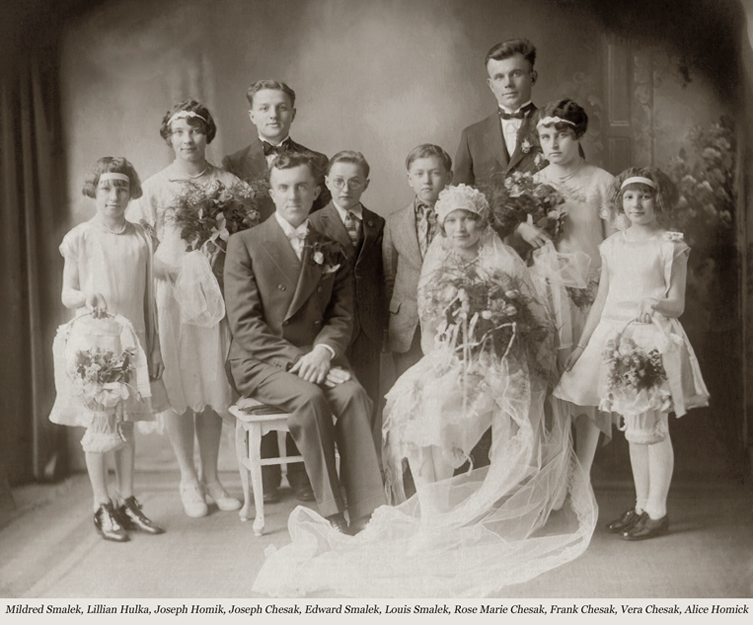 Marie (Alois’ wife) is sitting at the lower right. Grandmas Rose Hulka Chesak is at the far right. The Hulka family. 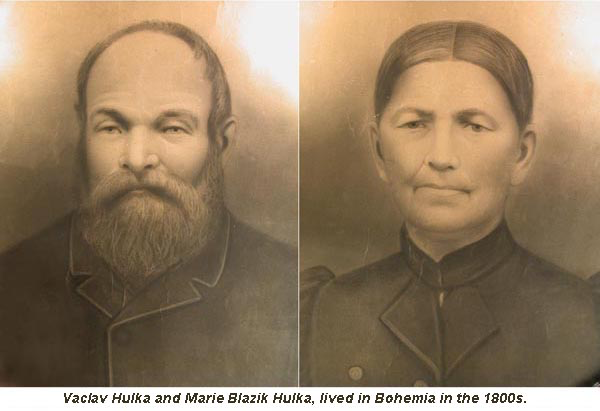 Alois and Marie Hulka are together in the center. 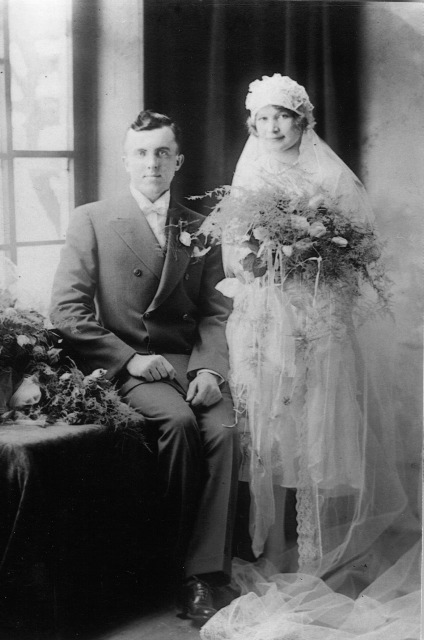 Marie Peleska, Frank Chesak (son), and Husband James Chesak, who was drafted for WWI and was married Regina Fisher, just before he left for service. Dad thinks being drafted prompted them to get married. 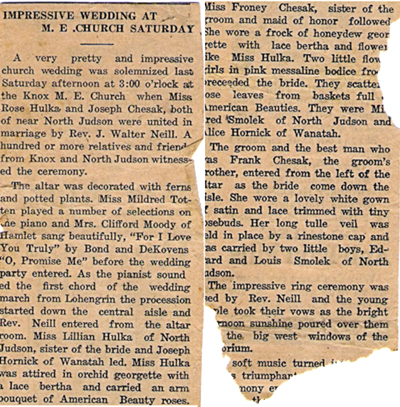 Dad was at the wedding reception at a farmhouse near Toto, Indiana, where the families emptied the house of all the furniture for the party. 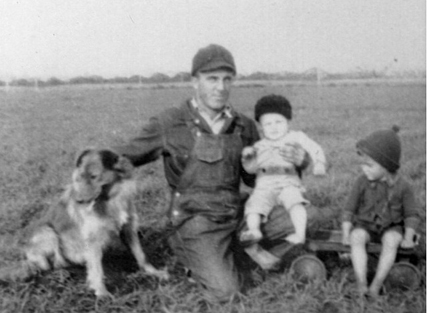 David Dean Chesak (my dad) passes away in 2013 (heart condition).